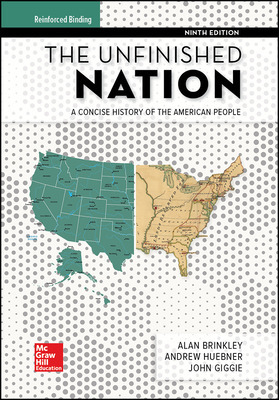 The best-selling concise text for U.S. history and respected for its clear narrative voice and impeccable scholarship. The 9th edition provides enhanced coverage on the diverse experiences and perspectives of Native Americans, African Americans, and women throughout American history. The Unfinished Nation’s organization guides students from start to finish. At the start of every chapter “Looking Ahead” questions provide guidance on the most important information. “Recall and Reflect” questions at the end of each chapter circle back to important content with more specific questions. The Timeline calls out key events in the chapter in a visual format. covering political, cultural, and social milestones. Finally, “Understand, Analyze, & Evaluate” questions cause students to pause to think critically. This helps students apply analysis and evaluation skills for deeper understanding.